Drawing event in Bassendean for the Queen’s Birthday. 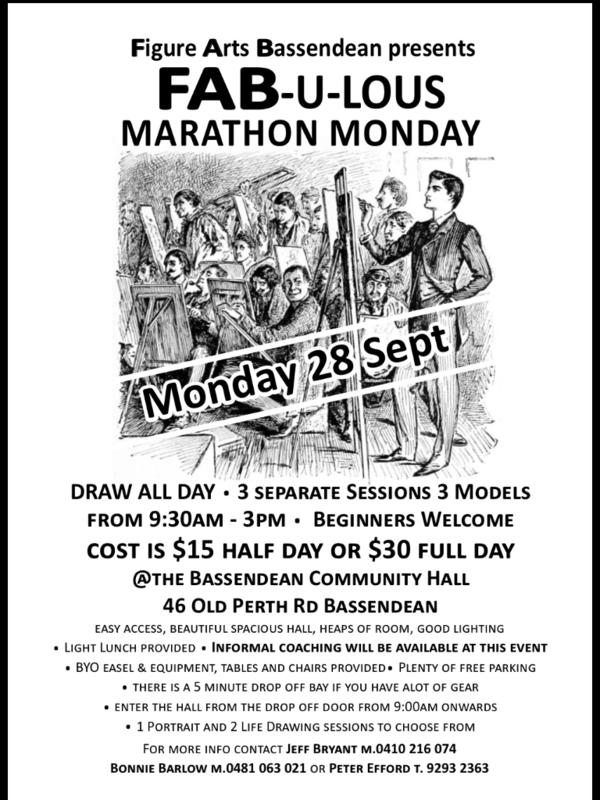 sorry about the super late update with this folks, but if any of you are looking for something to do tomorrow, why not attend a life drawing marathon in Bassendean? Categories: Bassendean, Holiday, info | Permalink. Tomorrow night (the 21st), we’ll be having Victoria in for the evening. The following week (the 28th) will be a holiday session, and Jules has been awesome enough to yes to running the session. For that night we’ll be having Amy in for the evening. Please not that there will be no coffee or tea on this night as Jules will not be able to access the urn which we use for this. My apologies to everybody for that. Categories: Amy, Holiday, UWA, Victoria | Permalink. A model update and yet another holiday? Just a quick note for the weekend that our session on Monday will now be a clothed model session (our first for the year) with Jane, as our pervious model had to unfortunately cancel. I’m not sure what outfit Jane will be wearing this time, but given her previous outfits (jungle girl, steam punk, burlesque and 1960s stewardess) I’m quite sure she won’t disappoint. The following Monday (the 20th) will be a male/female session with Kieran and Leah. And lastly, there will be no session on the 27th due to ANZAC day. Which from our perspective unfortunately makes April quite a short month. Categories: Clothed model, Holiday, Jane, Kieran, Leah, UWA | Permalink. We’ve been having a great turnout of late, so thank you all for that! This coming Monday (tomorrow night) will be a male/ female session, with a first for us: a 55 year old woman (Rebecca, who we haven’t had in before) with a 30 year old man (Travis, who we have had in quite a few times before). Every other time it’s been the other way around for us. The following week (the 30th), we have a new model from Germany in by the name of Mirjam. On April 6th there will be no session as it will be a public holiday, so we’ll be back the week after that. Categories: Double session, Holiday, info, UWA | Permalink.